German chemical and life sciences giant Merck KGaA has restructured its performance materials business with aims to strengthen its growth this year — a move that hints at Merck’s renewed attention to its key customers in the space including South Korean display makers Samsung and LG. Merck recently initiated a major restructuring of its performance materials business division. Previously broken down into smaller sub-units by material type, Merck’s materials business is now divided into three areas -- display solutions, semiconductor solutions and surface solutions. And according to Merck Korea’s Managing Director Glenn Young, Merck triggered this change to accelerate the growth of the firm’s materials business, where Korea is a major market, and to forge a business environment more conducive to innovation. “It’s an organization change, (accompanied by) new leadership in the segment. And the purpose of that is to accelerate the growth of the performance materials business,” Young told The Korea Herald in an interview on the sidelines of Merck’s 350th anniversary press conference held Tuesday in Seoul. With the change, Merck hopes to offer “combined expertise” to its customers, including Korean display makers like Samsung and LG, which are facing growing pressure to diversify and innovate, Young said. Under the new structure, clients working with different technologies for different platforms, as well as experimenting with new material combinations, will have wider access to Merck’s product offerings and technical expertise. The restructuring procedures come as part of the Merck’s latest efforts to bolster its materials business, which by nature hinges on its key customers staying competitive, Young said. The implications are particularly higher for Korea as it houses some of the world’s biggest makers of memory chips and display panels, produced using performance materials developed and supplied by Merck. Right now, performance material sales make up more than 50 percent of Merck’s total revenue in Korea. Though not the biggest market by size, Korea has also acted as a strategic hub of Merck’s display and OLED technology innovation. In Korea, Merck operates not only sites for development and production but also laboratories where it collaborates with customers to adapt different performance materials into their products. Merck also runs two OLED R&D facilities in Korea where new materials can be developed, produced and tested. In the future, Korea’s strategic importance will not change, despite China’s fast-growing presence in the global display business, Young said, when asked about potential changes in Merck’s market priorities. Merck’s recent opening of a new OLED technology center in China had led to some speculation that the German company may be shifting its OLED display materials hub from Korea to China. “We plan to stay close to all of our key customers (in Korea), as it’s important to understand how each customer uses our materials, and how it works with other materials. And this needs to be done in a strictly confidential setting,” Young said. Though the performance materials business is Merck’s main area of focus in Korea, it also has a growing stake in the field of life sciences, which -- together with healthcare -- forms the remainder of Merck’s three business areas. Merck’s life sciences division currently supplies baseline materials used in biologics production, laboratory systems and equipment as well as manufacturing support and training services. Its main clients include biopharma manufactures such as Samsung BioLogics and Celltrion. 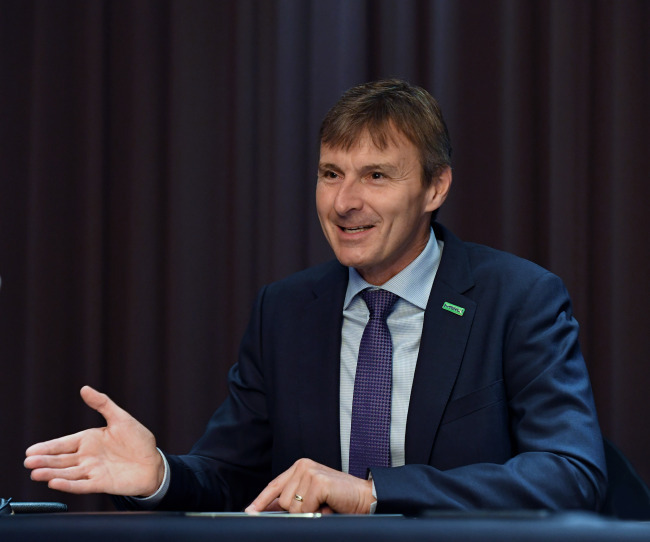 Eyeing long-term market opportunities in this space, Merck plans to continue investing in the life sciences business in the years ahead, Young said. In 2016, the company opened a biopharmaceutical production and development support center in Songdo, Incheon, dubbed the M Lab Collaboration Center. The next big project in the works is a new life sciences center in Songdo that will contain laboratories, manufacturing as well as facilities for production distribution. It is scheduled to open in mid-2019. Founded in 1668, Merck KGaA earned 15.3 billion euros ($17.90 billion) in revenue last year. It has around 53,000 employees worldwide in 66 nations. The Korean market accounts for around 4.5 percent of Merck’s annual revenue.